FRANKFURT—European Central Bank officials fanned across Europe Friday to deliver a common message to governments that bold measures are needed to reform their economies, raise productivity and improve the eurozone’s anemic growth outlook. The remarks from several members of the ECB’s 24-member governing council underscored the bank’s recent campaign to accelerate the debate in Europe on how to get the struggling eurozone economy on the right track without relying on the ECB’s easy-money policies. “The biggest bottleneck for growth in the euro area is not monetary policy, nor is it the lack of fiscal stimulus: it is the structural barriers that impede competition, innovation and productivity,” Bundesbank President Jens Weidmann said at a conference in Riga, Latvia, one of several ECB officials to speak Friday. “While in ’normal’ times it might be acceptable to reform one sector at a time, in crisis times it is not. Fairness must be a priority. And the best way to align vested interests is to reform them all at once,” Mr. Coeuré said. “The ECB is reiterating its main message to governments,” Mr. Gallo said in a research note. Friday’s comments came amid mounting concerns about the eurozone’s growth prospects and the ability of central bankers and governments to come up with a shared strategy to address these risks. The worries in Europe were a central topic of last weekend’s meetings of the International Monetary Fund, which brought together finance and central bank officials from around the world. The eurozone economy stalled in the second quarter, and recent figures on industrial product suggest the currency bloc barely grew, at best, during the third quarter. With the eurozone’s roughly $13 trillion accounting for nearly a fifth of world output, the global economy will struggle to get into a higher gear until Europeans solve their growth puzzle. Annual inflation, meanwhile, was just 0.3% in the eurozone last month, far below the 2% rate that the ECB and other major central banks consider optimal. But while these purchases have yet to even begin, financial markets are clamoring for the ECB to do more, primarily by purchasing large amounts of government bonds to reduce interest rates and cheapen the euro. But the comments Friday suggest some on the ECB’s governing council remain skeptical of this policy, which was used extensively in the U.S., U.K. and Japan. 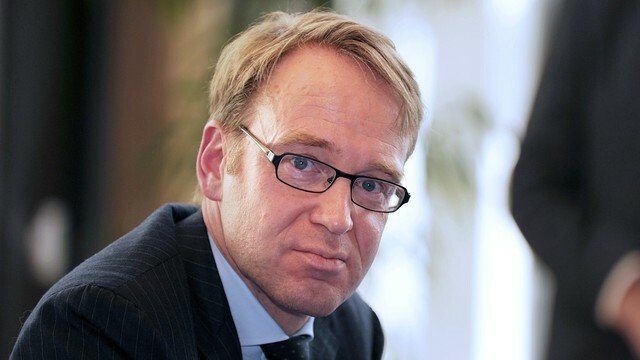 Mr. Weidmann noted that much of the weakening in eurozone inflation has been due to falling energy prices and the effects of reform efforts in parts of the region, forces that are largely outside the realm of monetary policy. He reiterated his criticism of the ECB’s asset-backed securities program, saying it transfers risks from financial institutions to the central banks and, ultimately, taxpayers. “This would run counter to everything we have striven to achieve in banking regulation over the last years,” he said. The top central banker in neighboring Austria, Ewald Nowotny, signaled the situation in Europe isn’t dire enough to require a more beefed-up response by the ECB. “It is not as if the ECB needs to open up the emergency toolbox,” he told journalists on the sidelines of an investor trade show in Vienna. Meanwhile, ECB executive board member Yves Mersch offered a fresh argument against major asset purchases by the ECB: they may widen the gap between rich and poor. “Nonconventional monetary policy, in particular large-scale asset purchases, seem to widen income inequality, although this is challenging to quantify,” Mr. Mersch said at a conference in Zurich, although he noted these side-effects sometimes have to be tolerated. The influences of monetary policies on wealth distribution “are one more reason to recognize that the nonstandard measures we have introduced have to be temporary,” he said. —Nicole Lundeen in Vienna and Juris Kaža in Riga contributed to this item.